Our cozy holiday farm with attached apartment situated in the heart of a beautiful scenery. The Vosges on the edge of Alsace. In every season you can enjoy nature and good living with us. In a moment you forget all your worries and switch to recovery. Arrive and feel good. Families with children, hikers, mountain bikers and horse-riding fans (like also Beginners) and of course all the others we are called with us always welcome. The relaxed atmosphere of our holiday court know our visitors appreciate. Depending on your preferences you can find tranquility and seclusion or sporty balance. The proximity to the Alsace Vosges to make a fantastic holiday destination in France. Here you will find a nice guest room for two persons with shower / WC. All leisure activities and attractions can be reached by a short way. We are happy to provide tips for recreational activities and cultural highlights. If desired, you can be very happy to experience a trail ride on our experienced horses. Our farm offers a very nice and quiet secluded location in the Vosges with a beautiful view of the valley. The built 1750 farmhouse has been restored. The entire yard is supplied with its own, healthy mountain spring water. The originality of our forest will amaze you. So is our farm at a great starting point for your vacation. For more information and more pictures please visit our homepage under It is also sufficient if you enter 'vogesenhof' on Google. On a passé un très bon week-end, Thomas et Bianca sont très accueillants et gentils. 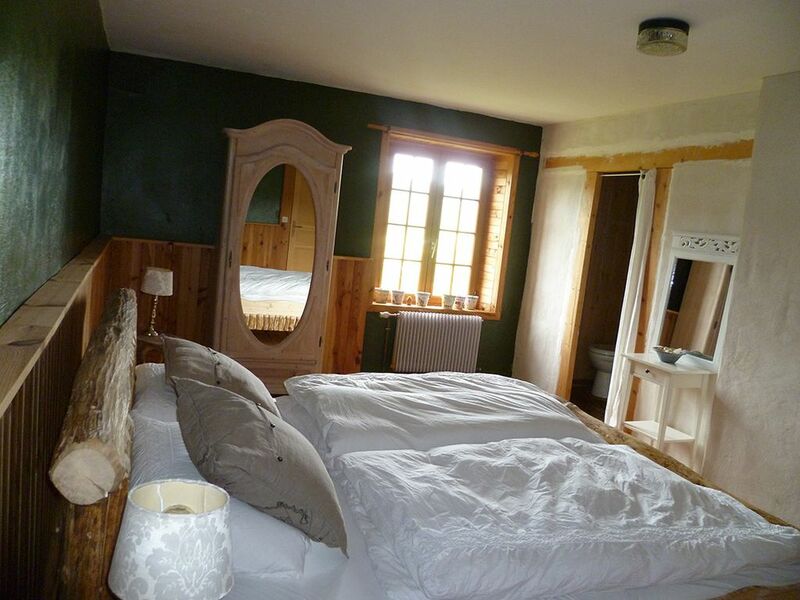 La chambre est belle, spacieuse et confortable, un grand salon est disponible pour les invités, la vue sur la vallée est superbe et les animaux sont les bienvenus ! On était très bien, d'autant qu'on est arrivé après 22h, merci beaucoup / Danke sehr !! Hôtes très accueillants et chaleureux, dans une ferme rénovée avec goût entourée de nature. On s'y sent très bien. Une salle à manger et salon sont mises à notre disposition. Les petits déjeuners sont divers et copieux. Et les animaux sont les bienvenus. Merci beaucoup Bianca et Thomas pour ce délicieux séjour de 4 jours. Très belle propriété, excellent accueil, chambre pleine de charme, ne changez rien ! Wir haben ein paar tolle Urlaubstage auf dem wunderschönen Hof von Bianca und Tom erlebt. Die Herzlichkeit, die Liebe zum Detail, das unglaublich gute Essen, das Zusammenleben mit all den lieben Tieren, die wunderschöne Natur...einfach ein super Urlaub! Wir kommen sehr gerne wieder. Très bien. Envie d'y revenir !!! L'on a passer un très agréable moment en La compagnie de Thomas et Bianca.